HOUSTON: Writing and reading are solitary activities. When authors and readers are coaxed out of their cocoons, their interactions can be exhilarating for both. One of the grandest venue for author-reader interactions is the Jaipur Literary Festival (JLF). JLF was launched in 2006 by literary stalwarts Sanjoy Roy, Namita Gokhale and William Darlymple. The inaugural evens drew about 100 people, “some of whom appeared to be tourists, who might have been lost,” according to Darlymple. Since that modest beginning, JLF has become the place to see and to be seen by auhors and celebrities alike. In 2018, the Jaipur festival in January encompassed 300 venues and up to 300,000 attendees with free access. The Jaipur festival attracts leading Indian authors such as Chetan Bhagat and Shashi Tharoor, literary icons such as Urdu lyricist Javed Akhtar and international celebrities such as Oprah Winfrey. JLF has also attracted corporate investment through Zee and is staged by Teamwork Arts. The JLF brand has also been exported outside India, most recently in the British Library in London, New York, Adelaide and in Boulder, Colorado. It was in Boulder that Consul General Dr. Anupam Ray invited JLF to come to Houston. Celebrated author and Lok Sabha MP Shashi Tharoor (left) with author and JLF Principal Namita Gokhale. Photo: Kaitlyn Ellison. Between the sessions, the attendees had the opportunity to buy books onsite from Brazos Bookstore and have them signed by the authors and even take selfies. Recognized authors who participated in JLF Houston included visitors from India such as Shashi Tharoor, Classical dancer Sonal Mansingh, Shobha Rao, and Indian Ambassador Navtej Sarna. Joining them on stage were Indo-American authors, including Houston’s own Chitra Divakaruni, Milan Vaishnav, Rajesh Parameshwaran and Australian Sharad Paul. JLF Houston also provided a platform for American authors such as Mimi Swartz, Roberto Tejada, and Kathy Reichs. Nigerian author Novuyo Rosa Tshuma and Pakistani-origin Anis Shivani were also featured in the interactive sessions. Other notable authors on stage at JLF Houston included Ambassador Navtej Sarna (left), Houston’s Chitra Divakaruni and Sonal Mansingh. Photo: Chris Dunn. 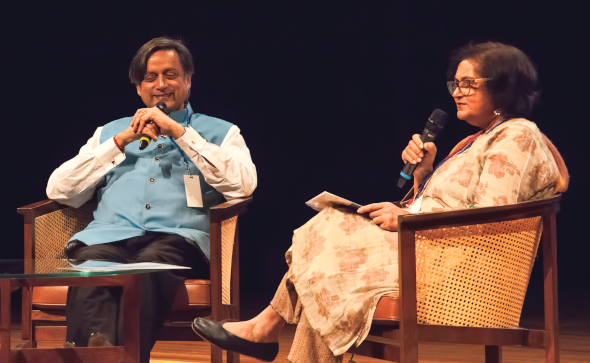 On the inaugural Friday evening, Shashi Tharoor shared the stage with Namita Gokhale. One of the topics of discussion related to his latest book: Why I am a Hindu. In light of the Hindutva movement since the election of the Modi government, Tharoor said he wanted to highlight the tolerant aspects of Hinduism. In fact, quoting Swami Vivekananda, Tharoor said Hinduism favors acceptance over tolerance. “Tolerance means you believe you practice a superior religion, but tolerate other religions. Acceptance means you accept others practicing their religion as much as you accept your own,” Tharoor explained. On Saturday, Houston-based author Chitra Divakaruni explained her interpretation of India’s epics from the viewpoint of its female characters. Her recent book, Palace of Illusions, is an interpretation of the Mahabharata from Draupadi’s viewpoint. Chitra is now finishing her book. The Enchanted Forest, seeing the epic Ramayana from the viewpoint of Sita. Also of audience interest was the lively political interaction between Tharoor and author Milan Vaishnav on the topic of The Dance of Democracy, moderated by TSU Professor and NPR political commentator/analyst, Jai Aiyer. Much to the delight of the “sold out” Houston audience, JLF Producer Sanjoy Roy has promised that JLF will return to Houston in 2019, and thereafter, on an annual basis.